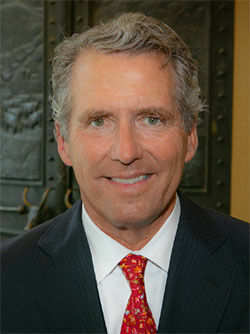 EDINBURG — The first visit by the new University of Texas Chancellor James Milliken to UT-Rio Grande Valley is confirmed for Wednesday and Thursday of this week, UT officials said. Milliken was named chancellor by the Board of Regents in August and took over the top leadership role on Sept. 17, as the 12th UT System chancellor. He is the former chancellor of City University of New York with more than 30 years of administrative experience leading major university systems. Milliken is following the footsteps of former chancellor and U.S. Navy Admiral William McRaven, who paid several visits to the newly created university before stepping down in May citing health issues. He also follows McRaven’s predecessor, former Chancellor and transplant surgeon, Dr. Francisco Cigarroa, who being from Laredo has strong ties to the Rio Grande Valley and led the system before and during the creation of UTRGV. Over the course of his first month in office, Milliken has toured several UT institutions, including UT-El Paso, UT-Tyler and UT-San Antonio, where he met with officials and students for a day. But in the case of UTRGV and its widespread campuses, the visit had to be expanded throughout two days. The plan is to have the chancellor tour each campus — including the new School of Medicine — and meet with administrators, students and faculty, Bailey said. During both days, the chancellor is also scheduled to meet with elected officials and community leaders. Bailey said the hope is that through these meetings, Milliken gains a better understanding of the uniqueness of the university and the region.